Twelve years ago , before Keystone's inception, as a city girl moving to the country, you begin to notice the wildlife, nature . . . . and oh.... I wonder who's cat that is? It looks pretty bad. Oh he's looking for food. . . sooo you leave him a plate of food. He watches from a distance and when you leave, he hurries to eat it as fast as he can for fear of humans and other animals. Watching over his shoulder with every bite, but desperate to eat the food. So the next day, you leave another plate , and he returns. So now they begin to understand you are not going to hurt them, but they keep their distance. As days progress you begin to see two cats waiting, then three. You realize they have no one that cares. One has a puffy eye, one may have an open wound, or is limping badly. And so it goes. We learn that all animals need compassion, especially the homeless domestic ones. They are intelligent creatures and on a whole they care and look out for each other. They live in groups / colonies. They are family. Not many realize that to reach out with a small act of kindness may make the difference of them living longer, healthier lives. Ferals living outside don't feel abandoned or unloved, they adapt and try to survive. Many don't. But being alone with no human interaction takes it's toll, and they will eat garbage, and rodents riddled with disease. They get infections, suffer and die. They mostly get hit by cars or attacked by wild animals. Sadly some die of starvation and lack of shelter. They don't know the meaning of feeling safe. Sadly, they do not deserve this, but with a little help, we can change their world and give them hope. It starts with showing kindness and compassion to one. Other medical attention as needed. Intake and rehabilitaion of humane , and hoarding cases. Including medical attention, vaccines and adoption placement. 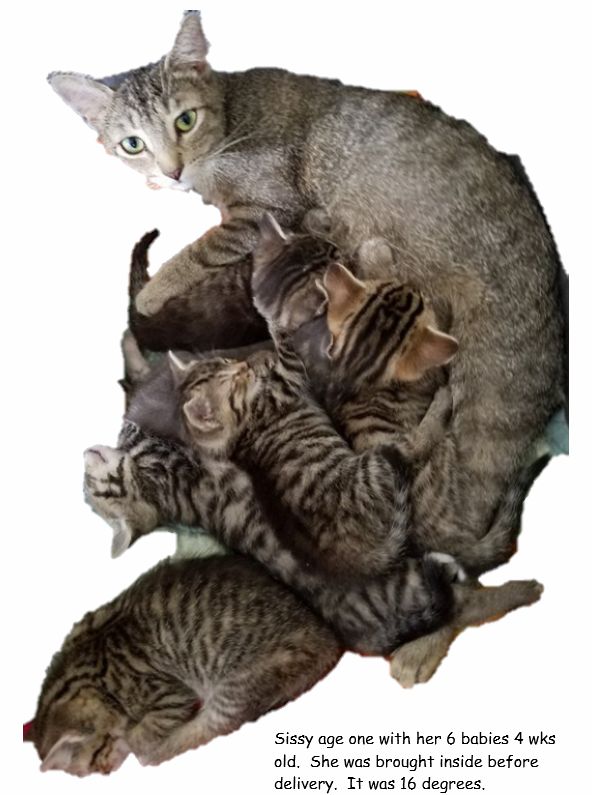 WE HAVE KITTENS AVAILABLE FOR ADOPTION ON OR AFTER JUNE 15, 2018. Please check back for pictures of available adoptions including the one year old Moms! Adoption requires an application, references, home visit and an adoption fee of $75 that will cover the cost of first vet visit, vaccines and spay / neuter certificate . Watch for upcoming dates for income based cost , spay / neuter clinic!